W3C (World Wide Web Consortium) - The mission of the W3C is to lead the World Wide Web to its full potential by developing protocols and guidelines that ensure long-term growth for the Web. W3C primarily pursues its mission through the creation of Web standards and guidelines. Since 1994, W3C has published more than ninety such standards, called W3C Recommendations. W3C also engages in education and outreach, develops software, and serves as an open forum for discussion about the Web. WAN (Wide Area Network) - A computer network that spans a relatively large geographical area. Typically, a WAN consists of two or more local-area networks (LANs). 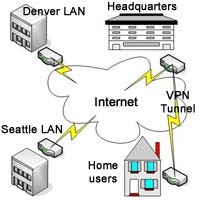 Computers connected to a wide-area network are often connected through public networks, such as the telephone system, leased lines (ISDN), satellite, microwave, or other connection method. The connected LANS can be on another in a building, or as far away as in another country. The largest WAN in existence is the Internet. There are a wide number of WAN connection types and speeds including DSL, broadband cable, T carrier lines (eg. T1), microwave, satellite and many others. If you are interested please look into your local broadband, DSL. or microwave internet provider. Windows Domain - The term domain in Windows environments refers to a logical group of computers running versions of the Microsoft Windows operating system that share a central directory database. Currently, this database is known as Active Directory on Windows 2003 domain controllers. Domains do not define the physical makeup of a LAN or WAN, but rather they define security and access. Domains centralize user and computer (client) access to network resources via user accounts stored in the Active Directory database on the domain controllers. Do not confuse this term with Domain Names on the internet. WINS (Windows Internet Naming System) - Microsoft's definition of WINS is "An enhanced NetBIOS Name Server (NBNS) designed by Microsoft to eliminate broadcast traffic associated with the B-node implementation of NetBIOS over TCP/IP. It is used to register NetBIOS names and resolve them to IP addesses for both local and remote hosts." WINS is a proprietary Microsoft name server and with Windows 2000, Microsoft introduced dynamic DNS which has largely replaced the need for WINS. The fact that DNS is the de facto standard on the internet is a large part of the reason that WINS is disappearing. 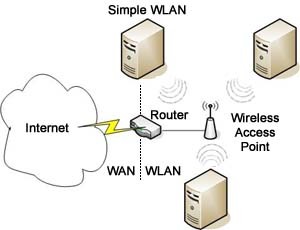 WLAN (Wireless Local Area Network) - A WLAN is local area network available through a wireless connection using the 802.11 family of standards. The wireless connections utilize spread-spectrum technology based on radio waves to enable communication between devices in a limited area. WML (Wireless Markup Language) - Formerly called Handheld Devices Markup Languages (HDML), WML is a markup language that allows the text portions of Web pages to be presented on cell phones and PDAs via wireless access. WML is part of the Wireless Application Protocol (WAP). There are filter programs available that can convert HTML pages into this format. Workgroup - A workgroup is a logical collection of computers identified by a unique name. Members of the workgroup can see and access resources shared by other computers within the group. Unlike a domain configuration, each computer in the workgroup manages its own security rather than having centralized accounts and security managed by a domain controller running Active Directory. Workgroups are only manageable for very small peer-to-peer networks. Worm - Worms are stand alone programs that do not need other programs in order to replicate themselves like a virus which relies on users to inadvertently spread it. Viruses and Worms can be prevented by installing anti-virus software which can be run on servers, clients, firewalls and other devices. WRAM (Window Random Access Memory) - Despite its name, this type of memory has nothing to do with Windows OS. It is an updated version of VRAM in that data can be read from the memory chips whilst new data is written into them - VRAM could only do either a read or a write. WRAM is no longer to be found on new devices; for graphics cards, it was rapidly superseded by SGRAM and then DDR-SDRAM.